Nick Hornby is a British writer known for his About the Boy and High Fidelity novels. However, for soccer fans, his first novel was the most important. Fever Pitch became shortly after publishing the classic literature for soccer fans all around the world. It is not surprising that even in our rankings Fever Pitch holds number one position. Love to football and Arsenal London is subject to this absolutely perfect book from Nick Hornby. Season after season, memories of important matches or matches which stood in author’s memory due to some reason. Every football fan with at least a small amount of self-irony will find something in this book. At least one small thing he will definitely know from his football fan life. You will read the first paragraph and you will find yourself smiling. And a smile from your face will not disappear until the end of the book. Sometimes you will nod in approval, sometimes burst out with a laugh. Hornby writes about his passion and his club with detachment and self-irony. He knows that for non-football people he looks pretty crazy. And small details reveal he is, in fact, crazy soccer fan. You probably do not know line-up of Arsenal from season 73/74 as Nick Hornby, but even this facts are not boring. It is not yearbook full of facts, it is free reminiscence supported with indisputable facts. 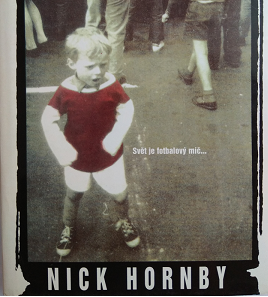 Nick Hornby does not write just about football and Arsenal, the second storyline is his own life. The connection between football matches and his personal life is vital for the book. And you can follow author path from school to university, from university to work and finally to becoming and writer. Also when writing about his personal life he uses a lot of self-irony and book gets another pleasant dimension. You will keep fingers crossed to Arsenal and also to the author himself. You will wish them some success. Chapters will lead you in years, seasons wins and losses and at the end, you will be sorry, that Hornby did not finish the book yesterday. You will miss his opinions about the last ten years you remember most clearly. Nick Hornby could skip all the unpleasant parts of football matches as racism and hooligans and book would be still very good. But he did not avoid anything and stands for his opinion. He knows that soccer has problems and he is not hiding it. That makes the book even better. Fever Pitch is the book written by an extremely talented author. (It was proven later with other books he wrote). This book is not just for soccer fans, it is for everyone. But if someone in the future will make a list of obligatory reading for football fans, there is no doubt, the Fever Pitch will be number 1.